Meet the women and girls who front our new Squash Girls Can campaign. Hear how they got involved in squash, what keeps them playing and what they love about it! Inspired? Locate your nearest female-only session. Ana finds that squash gives her a great workout in just 45 minutes and leaves plenty of time for a coffee with friends after the session. Although Ana only started playing squash a year ago, at the age of 50, she has already become a level 1 coach and loves coaching squash to children in her local primary schools. Gemma's love of squash took off at university where she's "made friends for life." Gemma finds squash great fun, sociable and a chance to boost her fitness. 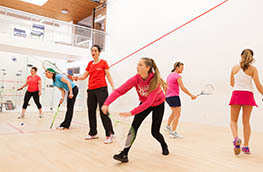 Sarah loves the energetic and fast-paced nature of squash. Being a working mum with little time on her hands, she loves the fact she can step on court for 20 minutes and burn the same amount of calories as she would in the gym in an hour. Meet sisters Amy, 27 and Lexie, 13 who love getting on court together, having fun whilst exercising. Squash is one of the few sports that the girls get to do together. For Amy, who has Down's Syndrome, it's an opportunity to have a run around and get fit. Lexie loves the social side and has made new friends. Squash also brings out her competitive side! Squash is one of Sue's greatest passions and one she believes is lifelong, having played and coached for most of her life. Sue's made an incredible network of friends through squash. After battling cancer, the squash community helped her get back on her feet - both physically and mentally, and believes "those kind of relationships last a whole life." Helen had reservations about picking up a racket as considered herself to be too old and unfit. She was persuaded to give it a go by some friends and since then there’s been no stopping her! Her confidence has surged, as have her fitness levels. Jennifer was never sporty at school, and would never choose to exercise for fun! By chance, she got involved with a charity squash event and has never looked back. Jennifer can fit squash around family life and shift work, as well as giving her something that's just for her, away from work, or being a mum. Squash gives Jennifer the chance to meet people from all different backgrounds that she wouldn't typically meet otherwise. It also allows her to be herself: "You don’t have to look a certain way, you don’t have to be a certain person, anyone can play it." For Lisa and Molly, playing squash means quality time together as a family, having fun and keeping active. Lisa finds squash an effective high-energy workout that both her and Molly can fit in around their busy lives. Lisa’s become a qualified coach, and with Molly’s assistance, the pair run a weekly tots session, inspiring children as young as three to pick up a racket. Playing regularly with a group of like-minded mums has also allowed Lisa to make new friends, get active and find quality time for herself. Inspired to hit the court? Locate your nearest female-only session. Access images, videos and tweetsheets to help you promote your female-only sessions.